How I Became the Bomb has released the final installment of their 3-song digital EP series. Go grab it for free at their website. This one is titled Through Adversity to the Stars! It’s a fine piece of work I must say. And The Relatives recently did a Lake Fever Session. They just posted the videos on the website. The Fleetwood Mac cover is especially awesome. My band Tigers Con Queso will be playing with them on June 20th at the Zombie Mansion along with Team Illuminati and Sunset Soundtrack from Atlanta. It’s the final show at this awesome house. I honestly wish they’d done more house shows there. It has a huge living room that, when filled with people in a party setting, makes you feel like you’re in a John Hughes movie. Johnny Kingsbury has posted the photos I did at Happy Valley on May 29th. Check it out if you were there, or if you want to see photos of people getting drunker and drunker as the night goes on…. I thoroughly enjoyed Hipster Runoff’s take on those epic wolf t-shirts. Are you a WolfBro? Geek alert: i09 posted a video clip featuring a few scenes and interviews with the cast of Stargate: Universe. The new spinoff show is scheduled to air this October. I photographed Coldplay and Snow Patrol at the Sommet Center this past Saturday night. Check out the pics and the spin review at Nashville Cream. Remember Geordi La Forge from Star Trek: the Next Generation? Who doesn’t, right? Well, that ridiculous looking visor he wore to give him vision is getting much closer to becoming reality. I absolutely love it when gadgets or ideas presented in science fiction years ago starts to become reality. Watch this video on Live Science about a new technology that involves a camera installed on a set of glasses that transmits a video signal to a chip that’s surgically implanted on the retina. Of course, this woman’s vision is still limited to “that’s a light area, and that’s a dark area” but it’s a step in the right direction. In 20 or 30 years, I’d say this technology will be far enough along to be very comparable to that of La Forge’s visor. 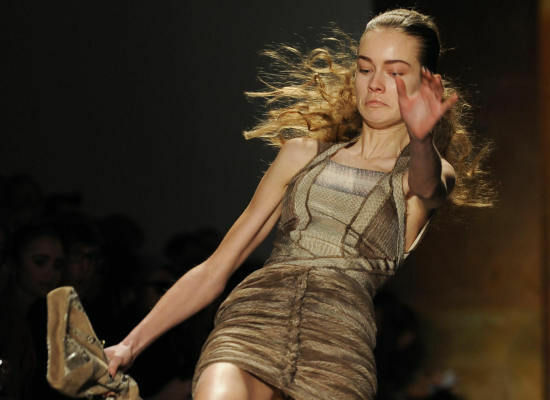 This image links to a Huffington Post article about not one, but two model mishaps during Herve Ledger by Max Azria’s Fall 2009 fashion show in NYC’s Bryant Park on Sunday. It has a slideshow with several images from Getty capturing each moment of the falls. Some images slightly NSFW. Tonight- Cage the Elephant/Autovaughn @ Mercy Lounge… meh. Saturday- THE ONLY THING HAPPENING IS MY BAND TIGERS CON QUESO WITH WE WERE THE STATES, BETTY RATS, AND COUNTRY DEATH @ SPRINGWATER. COME. Sci-Fi geek-out alert: Stargate Universe is officially in the pre-production stage. Most of the cast is nailed down, the biggest name arguably being Robert Carlyle. More at my new favorite geek blog, iO9. Why is science important? There’s a website dedicated to having people explain it in their own way. I like to put it simply, science IS EVERYTHING. Last night at band practice our bass player/beard contributor Josh told me about this ridiculous ska song called “Jesus is my friend.” Today he sent me the video. I had to post it. WTF?